Honey (badger), is that you? 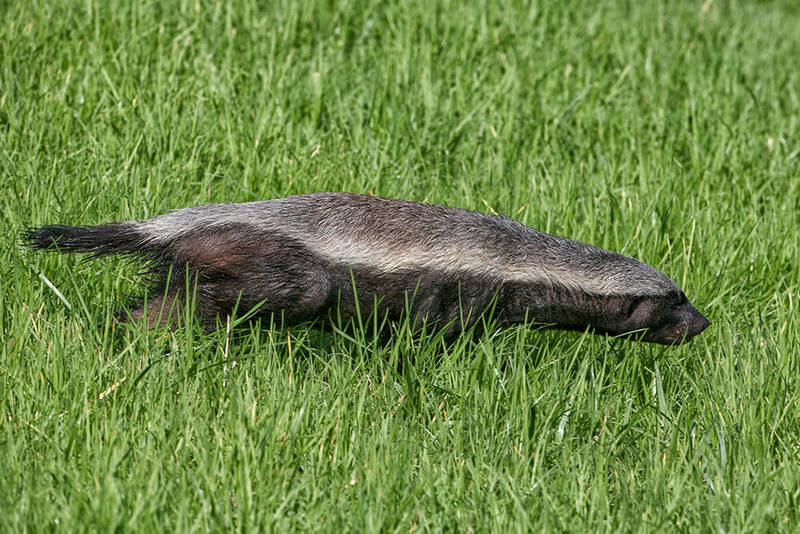 The honey badger is part of the weasel family, related to skunks, otters, ferrets, and other badgers. 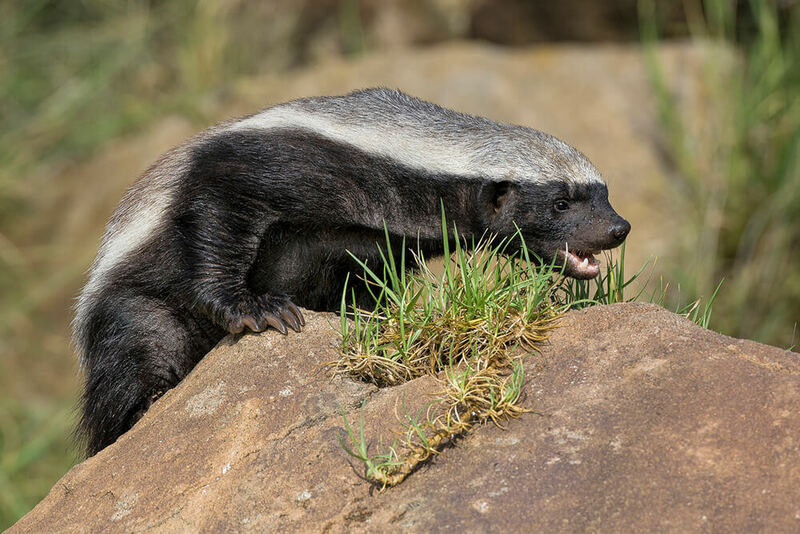 Its proper name is ratel, but it gets the common name honey badger from what seems to be its favorite food: honey. Yet what the animal is actually looking to eat are the bee larvae found in the honey! This tough little critter has a stocky, flattened body with short, strong legs, along with long claws on the front feet for digging and defense. 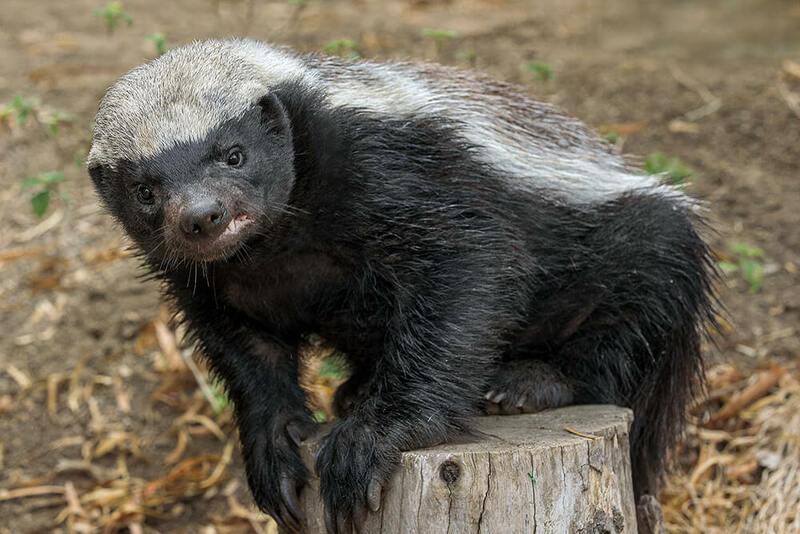 The honey badger's hair is thick and coarse, mostly black, with a wide gray-white stripe that stretches across its back from the top of the head to the tip of the tail. Does the honey badger have a sweet personality? No! It would be hard to find a more quarrelsome animal than the honey badger. It doesn’t start fights it can’t finish, and it makes an impressive foe. Also, the honey badger's skin is tough and loose, allowing the animal to twist around and bite an opponent that has grabbed it by the back of its neck. Combine that with a massive skull, strong teeth, and that awful odor, and you have an animal nobody wants to mess with! Honey badgers are native to areas of Africa and Asia, from southern Morocco to Africa’s southern tip, and western Asia’s Caspian Sea, Turkmenistan, Afghanistan, Nepal, and western India. They live mainly in dry areas but are also found in forests and grasslands. Honey badgers are good swimmers and can climb trees. With its long claws, the honey badger digs burrows up to 9 feet (3 meters) long and up to 5 feet (1.5 meters) deep. A single tunnel ends in a chamber, which is usually bare, where the honey badger rests. But when it comes to making a home, honey badgers aren’t afraid to use what’s already available to them: rock crevices and holes under tree roots, old termite mounds, or the dens of other animals such as aardvarks. Burrows made by Cape foxes, bat-eared foxes, yellow mongooses, and springhares are also taken over by the honey badger. As nocturnal creatures, honey badgers are extremely secretive and difficult to observe in the wild. They sleep most of the day, curling up into a ball to protect their face and belly. What's on the menu? Everything! The honey badger has an appetite for food ranging from small mammals and the young of large mammals to birds, reptiles, insects, carrion, and even a little vegetation, including juicy fruits. In zoos, honey badgers receive a commercial meat diet for zoo carnivores, mice, mealworms, and crickets. They get a bone to chew on once a week and are offered some fruit, mostly as a treat on hot days; honeydew is a favorite. And, of course, a scoop of honey is always appreciated! Mostly solitary, honey badgers maintain loose home ranges that often overlap. They may meet up at favorite foraging areas, where they sniff each other and roll around to scent mark the ground. Honey badgers can grunt, squeak, hiss, and whine, and are known for their deep and ominous growl. The female honey badger is left alone to give birth and raise her young. The expectant mother digs a nursery chamber and lines it with grass for her baby. After a gestation period of 7 to 10 weeks, one cub (rarely two) is born. The newborn is hairless with pink skin and closed eyes. At one week of age, its skin begins to change from pink to gray; two weeks later, fine gray hair begins to grow. The familiar white stripe appears about a week after that. By the time the cub is close to three months old, it has become a perfect miniature of its parents. It reaches adult size at 6 months is not ready to go off on its own until 14 months to 2 years of age, as the youngster needs time to develop those important hunting skills. When the San Diego Zoo received its first pair of honey badgers, a subspecies called the Vernay’s ratel, in 1998, a new challenge awaited the keepers. While they were aware of the housing and nutritional needs of this species, the animals’ aggressiveness was a challenge. However, the opportunity to work with a new species in a collection is one of the rewards of being a keeper, and our keepers were eager to learn as much as possible. The animals spent a good deal of time in a nest box during the day, coming out at night to investigate their new home, so keepers didn’t see much of them. Imagine their surprise when a newborn honey badger was found in the nest box on January 11, 1999! Apparently, the female had been about halfway through her pregnancy when she arrived in San Diego. Hers was the first birth of a Vernay’s ratel in the Western Hemisphere. Over the years, we’ve had nine more babies born here. Honey badgers are not currently on exhibit at the Zoo. Honey badgers are considered endangered in parts of their range, due largely to human encroachment, which reduces their food supply. The animal’s sweet tooth does not make it popular with people who raise bees for their honey. Some beekeepers kill any honey badgers they see just to protect their beehives. However, since honey badgers can’t jump, many beekeepers have found that simply securing the beehives a few feet higher off the ground discourages honey badgers from climbing up to reach them and keeps the bees and their honey safe. Many beekeepers in Africa are now producing “badger-friendly honey”—it’s a sweet deal for all! The honey badger's skin is so thick that it can withstand bee stings, porcupine quills, and even dog bites! Honey badgers seem to be resistant to snake venom.